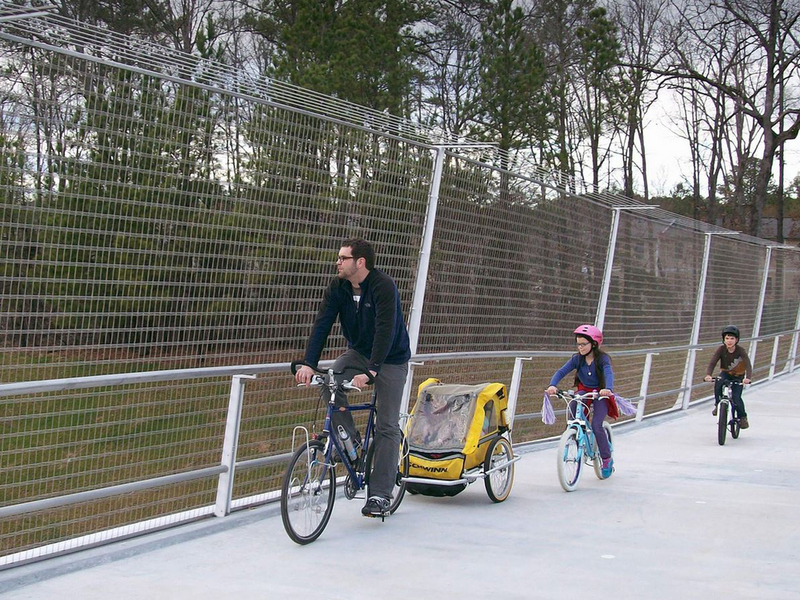 By closing a critical gap in the East Coast Greenway, the American Tobacco Trail Bridge serves recreational users and commuters in one of the fastest growing areas in the US. 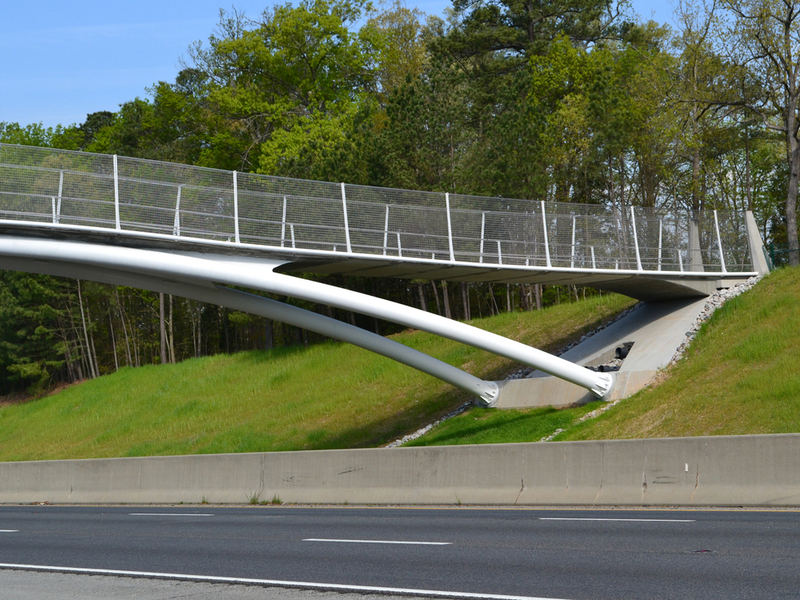 The topography at the site is symmetrical, and due to the height of the embankments along I-440, no ramping was required for the bridge. 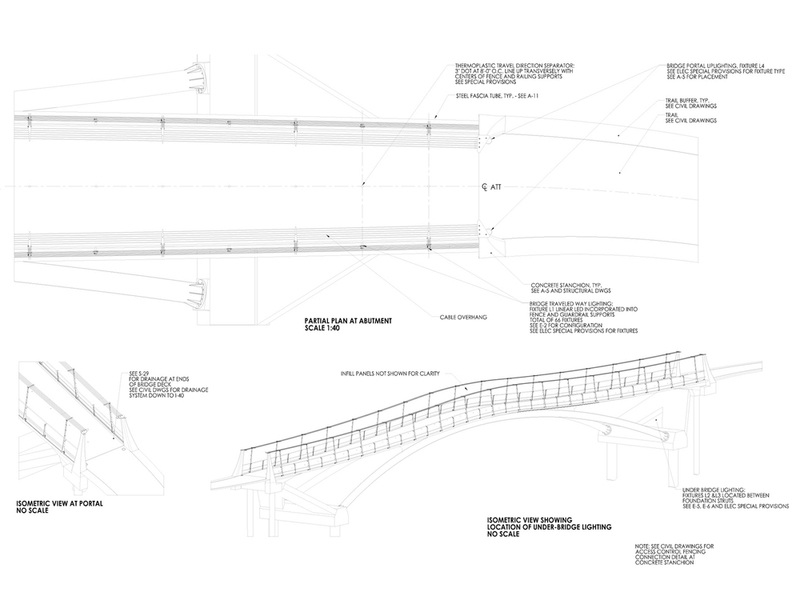 The structural form takes advantage of site geometry to self-anchor a stressed ribbon deck with a low-profile arch, eliminating the need for a heavy foundation system. The dual arches lean in toward the curving shape of the deck as it widens at the center. A primary design goal was to create as open a user experience as possible in spite of strict DOT requirements for fencing with small openings and overhangs. SGA developed a unprecedented fence support system with an exceptionally long spacing (16’) between sleek verticals. Wind forces are carried into concrete stanchions at each end of the bridge via overhead cables that run the entire length of the bridge. 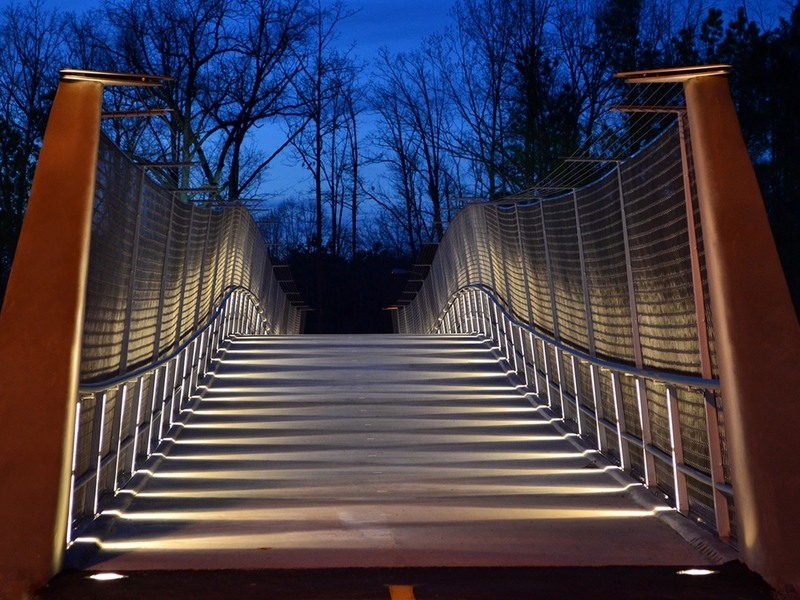 The deck lighting, integral to the vertical fence and railing supports, creates a rhythm as users travel over the bridge. 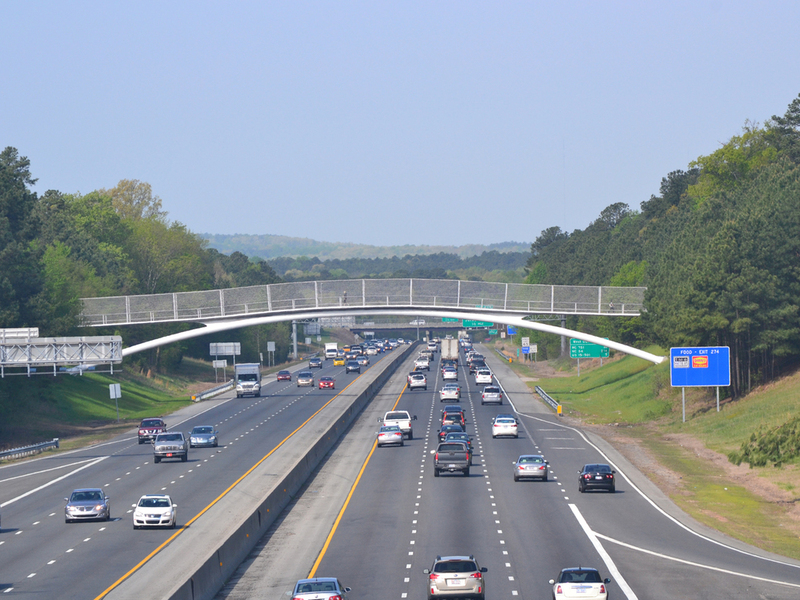 In a gesture to some bridge users’ tendency to stop at the center and take a look while others rush by, the deck plan is slightly lens-shaped. The widening of the deck toward the center of the bridge works to counter the visual tunnel effect which can make long parallel lines appear to merge to a vanishing point in the distance. The tunnel effect is also reduced by the fact that the fence and railing lines are curved as they follow the undulating curves of the deck as it spans each side and drapes over the arches. 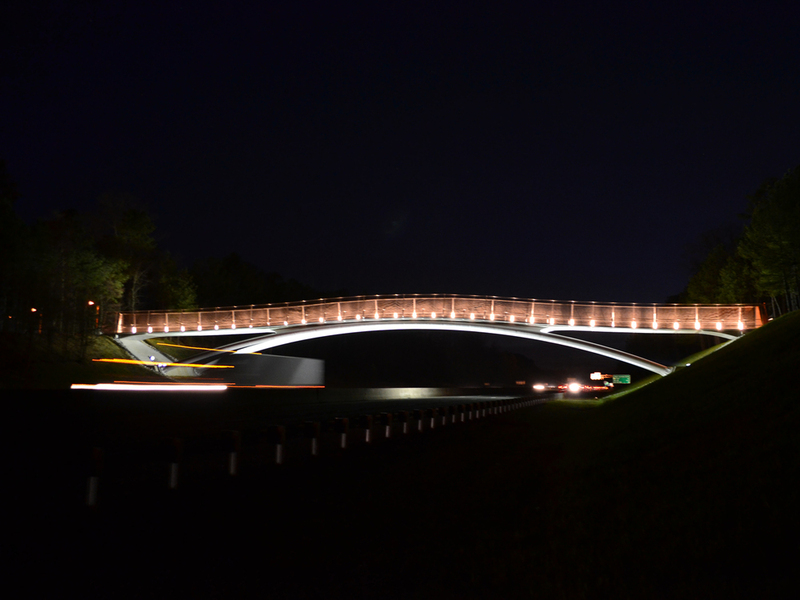 Scope of Work: Bridge Architecture services through 100% PS&E. Structural design of overhead cable and fence system.